We use our phones to navigate in the van, but it’s hard to find a good place to clip a phone on to the Sprinter dash without obscuring the air vents. We finally found a product that works. We chose to configure our own mount using components from the modular RAM Mount system. We both use smartphones that are 5-3/4″ by 2-7/8″. The RAM Mount X-Grip Phone Cradle fits them perfectly, either with or without a case on the phone. I imagine it would fit anything from a 2″ to a 4-1/2″ wide phone. They also make larger ones if you want to hold a phablet or iPad mini in place. The arms are on a spring. When you squeeze them together in one direction they open up in the other direction. After you’ve put the phone in place against the rubber holders, you can let go of the arms and they’ll grip the phone. Just be careful not to place any of the arm grips over your on/off or volume buttons. The four rubber grips on the arms keep the phone really well attached. I’ve seen motorcyclists using this same system. The mount does also come with a rubbery WebGrip thing that you can use to hook over the phone for additional peace of mind, but we haven’t found the need to use it. 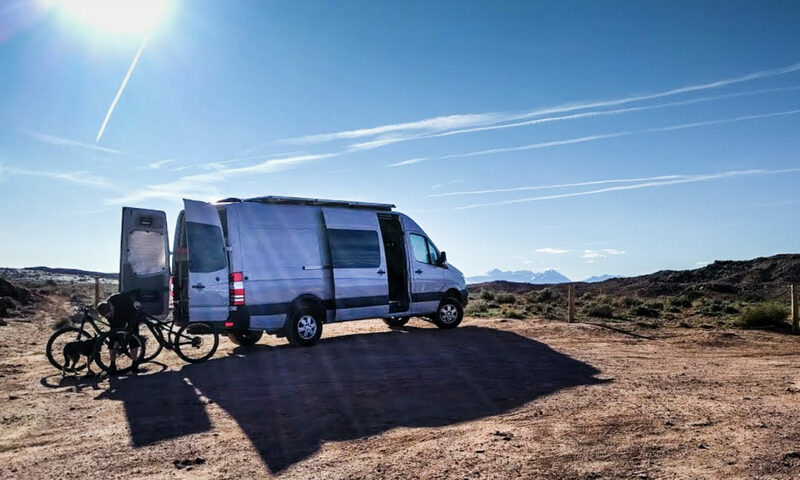 Even when we’ve been driving on some serious washboard and rock on dirt roads in Moab the phone has stayed put. The whole system works using 1″ rubber ball ends that fit into clamps. We chose to keep the mount close to the dash, so we used a short dual socket arm to attach it to a base that will take an adhesive patch. The arm is adjustable so you can move the phone around how you want, and it locks firmly in place. Just a note of warning – the area of the dash above the USB and 3.5mm sockets is slightly curved. We used a thick foam double sided adhesive pad so that it would stick to the curve of the dash and the flat back of the base. 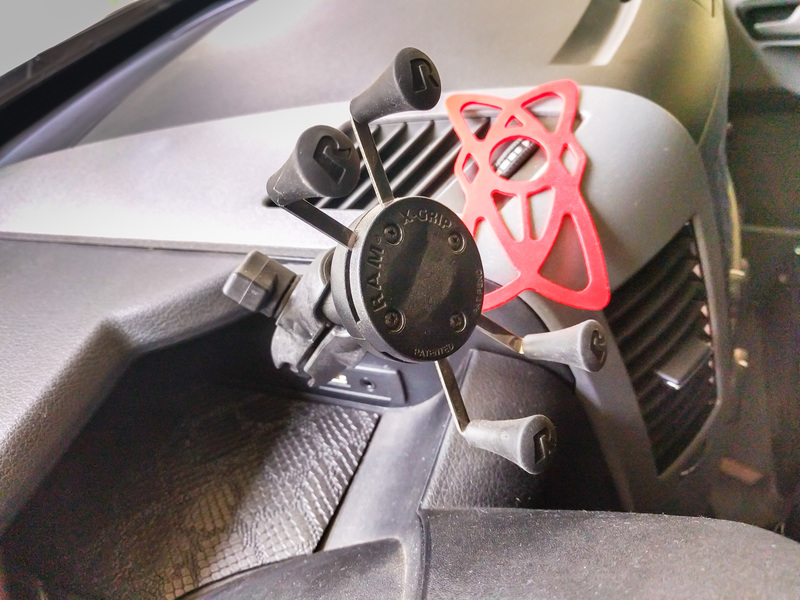 If you prefer a window mount suction cup, they make those too. Or for those of you with no rear view from inside the van, how about a mount for the mirror base? We looked at the Panavise brand mounts, which are made specifically for each vehicle type. They make one for the Sprinter dash, but it requires some serious installation and there’s always a pointy piece of metal attached to the dash area right over the vent. After you’ve installed the metal, you need to buy specific other components for your particular phone model. We also considered Proclip. Their mounts snap in to place rather than requiring a full-time fixing method. They still obscure the vent somewhat. Also, the accessories that clip in to the mounts didn’t seem like they had a strong grip, and they are expensive. They do however make charging holders if that’s something you care about. I’m a big fan of the RAM products and have used them for years on motorcycles for holding GPS units, phone, radar detector, GoPro camera, etc. Very versatile and flexible and as you accumulate pieces and parts, the ‘core’ components of the RAM system can be reused. I have a RAM ball mounted on the dash of the Sprinter to hold a Garmin 478 GPS and will certainly be adding others in various locations as my build progresses. I Just bought this ARKON phone holder and I love it. Mounted to the dash just below the vent – It puts the phone in the perfect place for use without taking your arm of the armrest. Could not be more perfect for my needs!